It takes one to know how to help one. That is why I became a special education teacher. Today, I teach 7th grade at The Lowell School in Queens. I know first-hand what struggling students go through, because I used to be just like them. When I was a kid, there were many times that I hated going to school because I couldn’t ‘get’ the lesson or understand what was happening in class. I was failing, but I didn’t know why. I started my career in general ed. But I remembered teachers who made it fun for me to learn certain things that just weren’t coming easily. I wanted to do that for other students, so I switched to Special Ed. My first year as a Special Ed teacher in 2010 was almost overwhelming. I had students on all different grade levels and with a variety of learning styles. Figuring out how to help each of them was a real challenge. Some needed to hear things read aloud; that could be a huge distraction for others. Some might be performing three grade levels above; others were several grades below. Yet they were all in the same 7th grade class! For help, I turned to technology -- specifically, the tools from MobyMax. What a lifesaver! Our school is a 12:1:1 classroom setting, with two teachers per class. All of our students have different learning disabilities, but MobyMax helps each one feel successful. For example, in math, I teach a modified 7th grade class. To teach the content, I have to break it down into small steps with repeated modeling and visuals. The visuals may include anchor charts or reference material, if it’s in our notebooks. Sometimes, we split into small groups and, using both teachers in the room, scaffold so that each student really understands the material. In that same way, Moby’s 1:1 technology gives us the ability to differentiate for individual students in a way that benefits all. MobyMax worked so well in our math classes that we’ve adopted the system throughout the school. 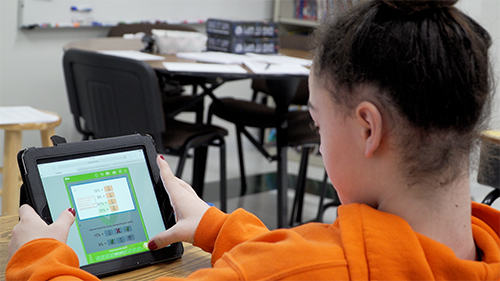 What we teachers love about MobyMax is that it completely reinforces what students are learning in class. Whether it is assigning lessons or giving them a math fact fluency review, it allows them to start at their own level and work through it. 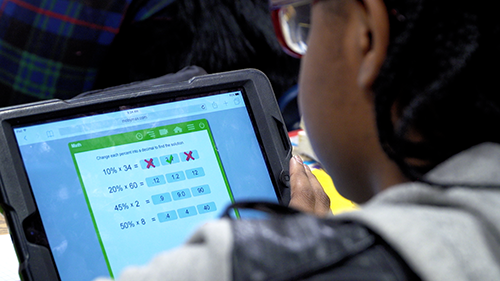 Students are required to complete 75 minutes in Moby a week in either Math or Fact Fluency. I find that assigning lessons that correspond with what we are doing in class is the most beneficial way to use MobyMax. Students can show their work on the screen as they work through problems, which allows me to check where the gaps in understanding are. If I check my teacher account at night and see that everybody struggled on one thing, that is our top priority the next morning. I’m not going to move on until we review the concept. Since that reinforcement is so important, it’s lucky that kids love using technology. They like getting badges and certificates, and earning game time keeps them motivated. Once in a while, I will log on to MobyMax’s Facebook page and find contests we can enter. Even if we don’t win, students love just being part of them. Sometimes we compete against other schools in the country; other times, we’ll just compete against other classes at our own school. Either way, the contests are very motivating. One of the best parts of MobyMax is that it saves me time! It’s quick and efficient to do online assessments rather than sorting through piles of paper, and I can track scores and see who needs to work on specific skills. I can see the whole class’s homework at a glance, as opposed to having to look at every problem for every student on a piece of paper. 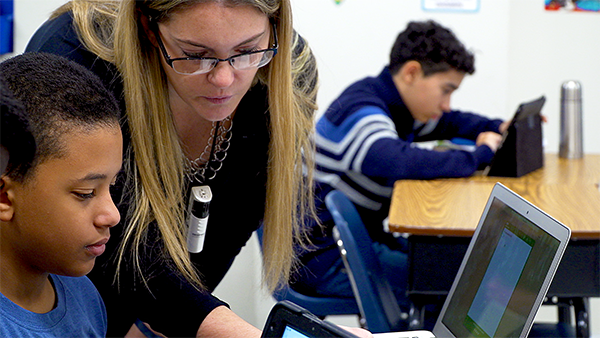 The system is full of innovative tools that save teachers time: online assessments, grading and markup tools, easy and accurate diagnostics, IEP reporting, and real-time progress monitoring. But there’s one thing that’s even better than the saved time and the ease of differentiation, and that’s being able to watch students go from struggle to success. If you teach Special Education, you probably have students come to your class in the fall with a lack of confidence. They are very unsure of their skills. The best thing you can do for them is help them find those “a ha!” moments, where everything clicks in place, and they understand a concept in their own way. I will use any tool at my disposal to make those “a ha!” moments happen, and that’s what MobyMax does. Caitlin Corlett is a seventh grade special education teacher at The Lowell School in Whitestone NY.